This recipe caught my eye because it said ‘salted’, then I noticed it also had ginger and have a trick to make them crinkly, so I’m giving them a go. The dry ingredients get whisked together – but not sugar: that counts as wet because it melts in cookies. The sugars get creamed with the butter, then the eggs get beaten in, before the dry is mixed in, followed by the chocolate & ginger bits. I skipped chilling it as it was workable as it was. I used my 2 tbsp scoop to portion out mounds (and the scoop struggled, would have been impossible if it had been chilled). 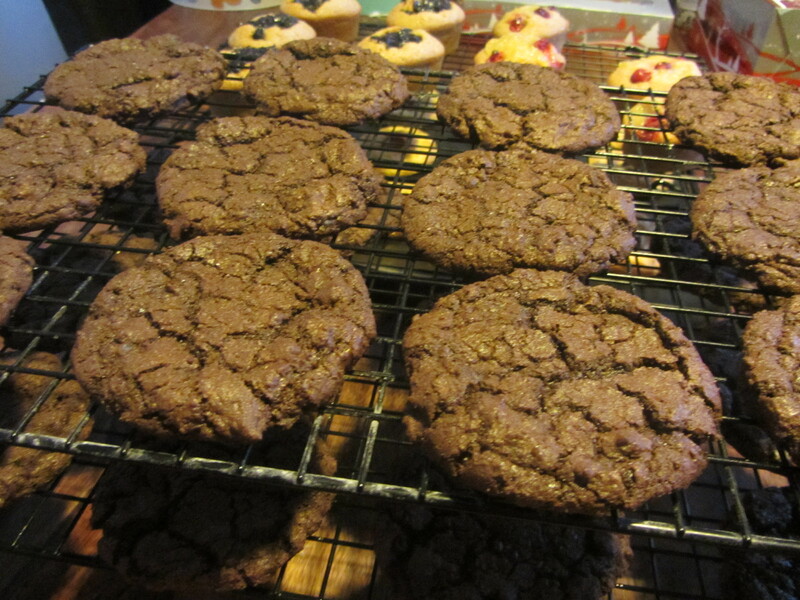 I got 24 cookies with about 1/4-1/3 of the mixture left (which is now chilling in the fridge along with lots of other half used cookies, pastries and marzipans…). After chilling for 30 minutes they go in a 170c fan oven for 5 minutes. Then they come out and get flattened with a spatula (sprayed with oil to avoid sticking). before going back in for another 6 minutes. 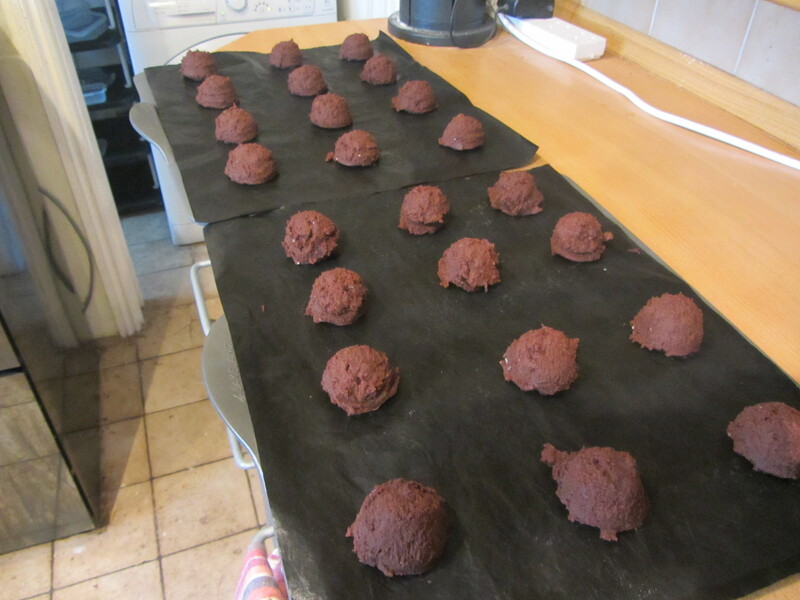 They go on the cooling rack still on the trays for a few minutes, before getting removed to the cooling rack. Despite just 2 tsp of salt, it has a great salted chocolate taste. I wonder if it being coarse salt makes the difference? They look great! Glad you tried the recipe. 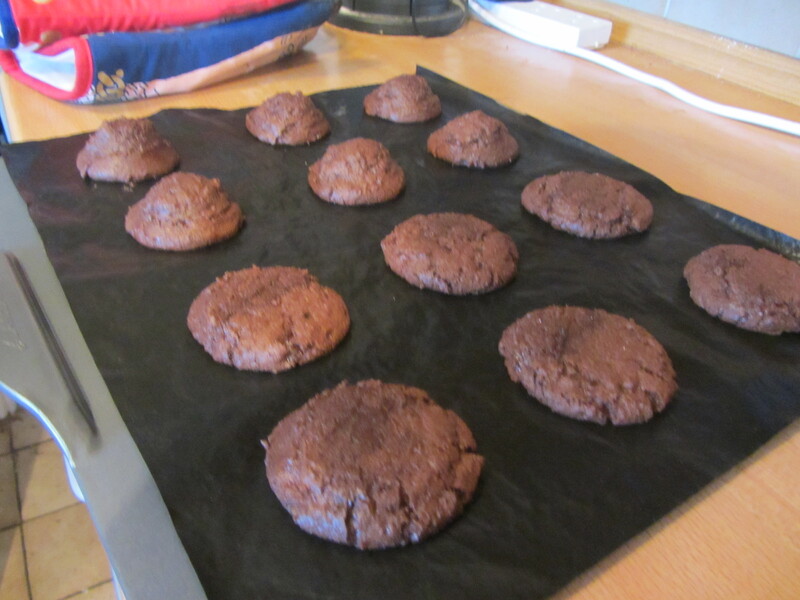 We’re very impressed with the look – the trick of cooking them for a bit then flattening really works, thanks! Cinnamon AND ginger cookies??? Have I just gone to heaven? You MUST save me one, or two, or even more. You shouldn’t tease me in this way, then eat them all yourselves.